A lovely example of Gillows Mahogany Bedroom chair. Raised on fluted and beaded Mahogany legs and retaining the original high quality brass cup castors. 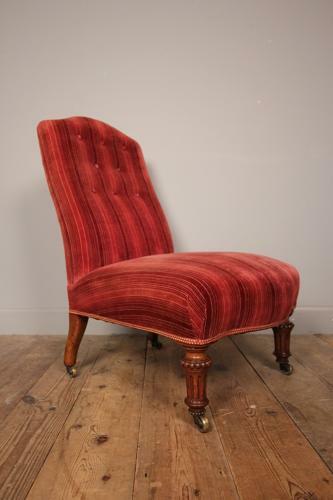 The chair having a buttoned back and sprung seat, currently upholstered in red velvet stripe, a strong little chair in good condition throughout. Stamped to back right leg "Gillows". English, Mid 19th century.